2018年3月15日，美国佛罗里达州迈阿密市一座过街人行天桥坍塌，致6死9伤。为此，美国CNN回顾了美国近50年来最致命的十大桥梁垮塌事件(The deadliest bridge collapses in the US in the last 50 years，By Alexandrea Penn, CNN)。（美国有线电视新闻网）多年来发生了许多致命的桥梁倒塌，一些是由于结构缺陷和其他碰撞或事故造成的。下面回顾一下近半个世纪以来最致命的10起事件。(CNN)There have been a number of deadly bridge collapses through the years, some due to structural deficiencies and others in collisions or accidents. Here's a look back at the 10 deadliest incidents in the last half century. The walkways on the second and fourth floor of the Hyatt Regency Hotel collapsed under the weight of guests. They then both crashed onto a crowded dance floor in the lobby. The American Society of Civil Engineers called it "one of the most devastating structural failures in U.S. history in terms of lives lost." Part of an Amtrak train fell off a trestle into the bayou and caught fire. 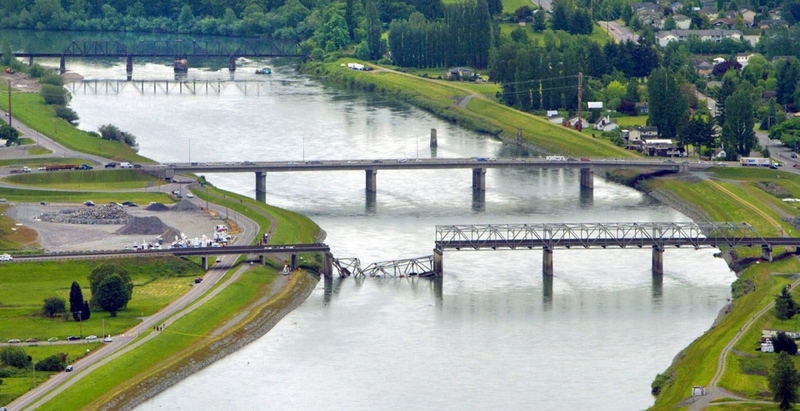 It happened right after a barge hit a railroad bridge. Minutes later, the Amtrak Sunset Limited hit the bent tracks and plunged into the bayou. According to eyewitnesses, the entire 1,460-foot suspended portion of the Silver Bridge folded "like a deck of cards" in less than 20 seconds and collapsed into the river. Investigators later blamed a fracture in the bridge for the accident. The Cypress Freeway Viaduct was a double-decker freeway structure that connected Interstate 880 to the Bay Bridge approach. The Loma Prieta Quake caused the upper deck to collapse on to the lower. A freighter struck the bridge during a thunderstorm, sending a bus, six cars and a pickup truck into the bay. A third of the I-40 bridge fell after a towboat pushed a barge into a support. Support plates that were about half as thick as they should have been were the likely cause of the I-35 W bridge collapse over the Mississippi River, investigators said. Faulty construction was to blame for the collapse of the bridge. According to the Times-Union, the bridge's pilings were built on the riverbed instead of driven into the bedrock beneath the surface. A freighter collided with a drawbridge, sending cars into the Brunswick River.